How to improve on a successful formula for manufacturing. Semiconductor manufacturing is becoming increasingly competitive as significant investments in capital equipment are required to meet consumer demand for higher performing devices with greater functionality. To boost their competitiveness, chip makers are adopting Industry 4.0 manufacturing techniques to achieve higher levels of operational excellence. In this blog, I explain Industry 4.0, provide examples of its use in the semiconductor fab environment and how Applied Materials is enabling this evolution. Before we go into details, let us understand what Industry 4.0 is. The concept of Industry 4.0 was first coined by the German government to describe the fourth industrial revolution enabled by new technologies like artificial intelligence (AI), big data, cloud computing and the Industrial Internet of Things (IIoT). The first industrial revolution was powered by the use of steam and water power, the second by the use of electricity and the third through computerization (figure 1). In factories, the production systems with networking connectivity are called Cyber Physical Production Systems (CPPS). With Industry 4.0, the CPPS are integrated and interfaced vertically so that any changes in the environment and in the value chain are reflected in the manufacturing process. Integrating manufacturing units horizontally into the value chain along with partners, suppliers, sub-cons, etc. Enabling and accelerating the integrations through next-generation technologies like cloud, big data, mobility and AI/analytics. First, let’s consider the vertical integration of a semiconductor fab. This involves integrating all the ISA-95 levels as shown below in figure 2. The ISA-95 levels span Level 0 for the physical equipment with all the sensors and actuators up to Level 4, which covers the enterprise business systems. Vertical integration at each level requires standardization of interfaces. In the semiconductor industry, equipment integration was standardized on the SECS/GEM interface quite some time ago. The high-speed SECS Message Service (HSMS) was established to support SECS/GEM communications via higher speed Ethernet. With the increased use of sensors, semiconductor equipment is now capable of transmitting high volumes of engineering data. In order to support high-speed diagnostic data collection, the engineering data interface, now called Interface-A, has been separated from the control interfaces and is used only for gathering equipment data. This meets the industry needs to have all of this data on a common platform for consistency and easy integration/analysis. The result is increased effectiveness of various analytic solutions like run-to-run (R2R) control and fault detection and classification (FDC) analysis, which are available as part of Applied’s SmartFactory manufacturing solutions. The next level of integration is the production execution/control, WIP (Work-In-Progress) management and logistics. According to Industry 4.0, the products (which in a fab would be considered wafer lots) are CPS (cyber physical systems) and are intelligent enough to know what they are, what product they will become and where they need to go. They can communicate directly with CPPS, which are equally intelligent as well. However, in the current semiconductor fab environment, products and equipment are not intelligent enough. 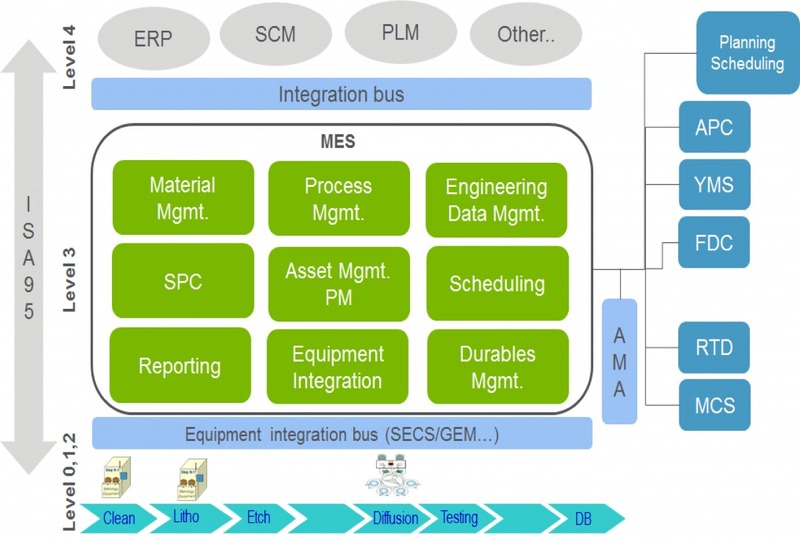 Also, in manufacturing operations logic currently resides in the MES (manufacturing execution system), which has information on the route, operation, etc. Once the lot is processed at a particular operation, the name of the next operation resides in the MES. The scheduling and dispatching is optimized through intelligent, analytic solutions (Real-Time-Dispatching and Scheduling solutions). When the product/lot (CPS) and equipment (CPPS) becomes intelligent (through AI), the MES, Dispatching and Scheduling solutions will become more logically de-centralized. MES, Scheduling and Dispatching solutions are a core part of Applied’s SmartFactory portfolio. Let us now look at the horizontal integration within the semiconductor manufacturing network. Currently, the semiconductor value chain is somewhat sequential. Lots/wafers from the fab go into a wafer-bank for assembly, test and packaging, and then onto a warehouse before being shipped to OEMs. 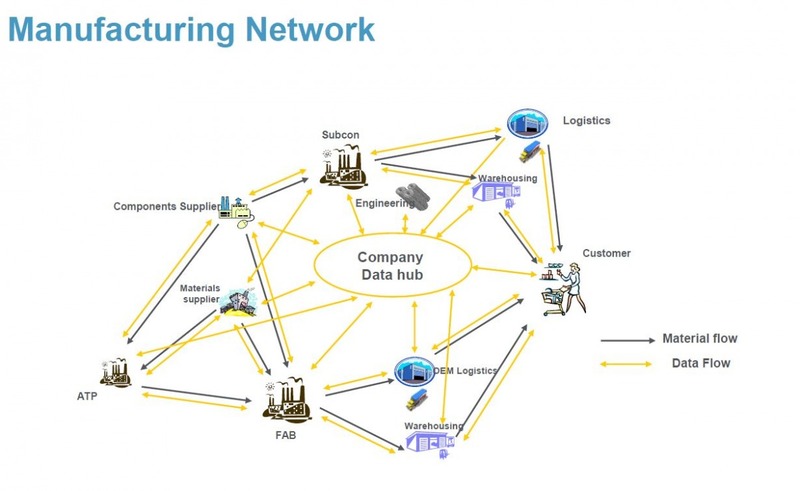 This scenario is changing; the manufacturing is becoming more network-like, with fabs and packaging plants being nodes within the network (as shown in figure 3). According to Industry 4.0 principles, we need to have a collaborative and intelligent network. Consumer-centric and demand-driven manufacturing is fueling the need for the manufacturing network to be distributive and collaborative. One way to achieve this is to have a manufacturing enterprise platform called a “Virtual Factory,” where we can integrate different factories, partners and suppliers onto a single platform. This can be achieved and expedited through emerging technologies like cloud computing, IIoT and big data. Applied has made many developments to enable semiconductor fabs to move towards Industry 4.0, especially from the vertical integration perspective. Various manufacturing solutions like our intelligent MES and our planning/scheduling/dispatching solutions are making fabs more agile and flexible. In the future, the process operations of a fab can be further transformed through AI. Fabs will become more of an environment where CPPS equipment fulfills requirements or demand from CPS lots through direct and intelligent communication. Manufacturing software like MES will become logically de-centralized, making sure that operations comply with rules/regulations. In upcoming blogs, I’ll continue to discuss the benefits and challenges of Industry 4.0 in the semiconductor industry, as well as MES for Industry 4.0 (MES 4.0). Ganesh Hegde is a senior product and marketing manager at Applied Materials. Hegde has more than 20 years of experience in the manufacturing domain within high-tech/semiconductor industries in both North America and Asia. He received a Master of Science degree in Computer Engineering from Arizona State University.